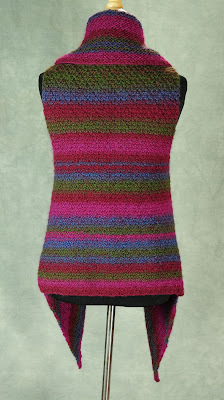 The photography is done and the pattern has been edited, its up on Ravelry here, Patternfish here and LoveKnitting here. The original yarn used here (Nashua Handknits Wooly Stripes) has unfortunately been discontinued. I'm often asked for suggested substitutes which then can be discontinued as well. As of, March 2013, many knitters tell me Taiyo Aran has been successfully substituted. As of Oct 2013 a reader tells me Mochi Plus from Crystal Palace Yarns is also an excellent substitute. Creative Poems Aran, Kaleidoscope, Odin and Filzwolle Fine Color appear to be an almost identical match to the original yarn. For current substitutes using Ravelry, do a search on 100% wool yarns, Aran weight, that are not discontinued. Put the word single in the search box at the top of the screen and you will get the current available yarn matches. Within those matches look for self striping yarns with long runs. I ended up wearing the vest to my monthly KNIT (Knitting Night in Toronto) group and I was very happy with it. I was given a shawl pin at Christmas that looks great on the vest so I wore it with the top edge folded back like a collar and pinned in the front the way it appears in the top photo. You can find the pins for sale here. My husband does the layout work on my patterns after editing so he made improvements to the schematic and the stitch legend before I uploaded it to Patternfish, Ravelry and LoveKnitting. I don't have much of a waistline, but look at what the stripes do in the top photo...they create one by adding in extra visual curves. I also noticed that if you leave it hanging straight that the vest hides fullness in the tummy area. Very pretty! Love the way the front band becomes a huge shawl collar.